Russell Speeders Car Wash is looking to hire an experienced, motivated, trustworthy, professional Mechanical Services Technician, trade licenses preferred. We own high volume car washes in Avon - Bristol - Manchester - Milford - Norwalk - Shelton - Fairfield - Stamford- Bedford, NY. If you're looking for a company that is expanding and offers career opportunity based on performance and not seniority, Russell Speeders is the place for you! Maintenance Technicians maintain our car wash facilities and equipment. They provide much of the behind the scenes work that goes into making our customers experience a clean, dry and shiny car. This position is for someone who likes to solve problems and keep everything operating efficiently and smoothly. Working knowledge of electrical (single & three phase high voltage). Capable of lifting as much as 50 lbs. Work 50 hours per week and Earn Up To $ 71,500/yr. Be mentored by the greatest automotive services professionals in New England and follow in the footsteps our most successful associates who started as hourly and became Managing Partners in as little as 4 years earning well over $ 100,000. A leading National Distributor is looking for an experienced car wash maintenance technician for the Phoenix area. The car wash technician will contribute to the success of the organization by maintaining and servicing customer car washes with efficient car wash solutions and excellent customer service. Strong Experience in car wash Maintenance, repair and installation of equipment. Scheduled routine visits to existing customers. Ensure that car wash solutions are optimally programmed. Ensure that the cost per car is within established range. Preventative maintenance on car wash equipment. Completion of standard summary reports for the above listed items. Service calls for repair issues as they arise. Expand the car wash solution and service business by seeking opportunities in new and existing markets. Must have good driving history and submit to a background check. 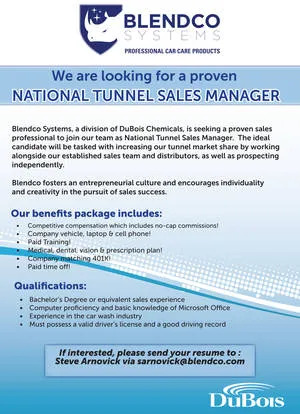 We are currently looking for highly motivated, self-starters to call upon primarily tunnel car wash operations in their defined markets for the purpose of selling car wash production cleaning solutions. The Sales Representative will sell Clean Touch Solutions to current and prospective customers within their defined market. This role will be accountable for achieving sales volume goals, revenue goals, and new customer growth targets within a defined territory through the sale of products and service offerings in a consultative sales solution manner. Education: High school diploma is required, college degree preferred Military and/or technical school beneficial. Energetic self-starter who is entrepreneurial in nature and can work in an autonomous work environment. Strong communication skills and be able to educate customers by providing beneficial consultation to close sales. Must be proficient with MS Office suite – CRM software – understanding of enhanced pricing/margin documents. 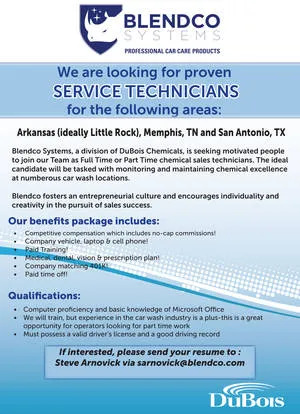 Micrologic Associates, a major Car Wash Revenue Control Solutions supplier is searching for a creative and self-motivated individual with sales experience to solicit, promote and sell our Pegasus and LogicWash / LogicLube solutions to Car Washes, Quick Lube establishments and distributors in the Texas market. Micrologic has seen tremendous growth and is looking to expand our presence in this territory. Candidates must live in the Texas market (no relocation package included) and must be willing to travel locally and regionally to demonstrate products and services. 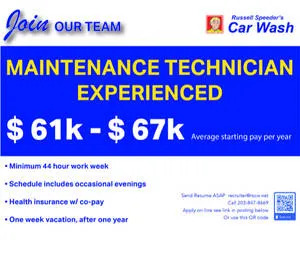 Reasonable amount of computer and car wash experience is needed. For print related advertising rates click here. Running a classified ad in Auto Laundry News? Why not increase your exposure by having it seen here as well? You can place your ad here, as it appears in the magazine for an additional charge of 30% of the magazine rate per month. Include your email address for instant response.